Are you looking for the Big Bang Theory's Sheldon Cooper's range of fun t-shirts? If so you've come to the right place from vintage superheros t-shirts to the number 73 tee. Sheldon Lee Cooper is (to me anyway) the star of the television series – The Big Bang Theory. One of Sheldon’s distinctive characteristics is that he always wears t-shirts over the top of long sleeved shirts and these are generally super hero t-shirts. On this webpage we look at some of Sheldon's memorable t-shirts and where you can buy one for yourself. It should come as no surprise that the reason that Sheldon wears so many super-hero t-shirts is because (according the Big Bang Wiki) he buys them all at the comic book store. Although we never see him purchasing apparel there it does make sense as he visits the shop every Wednesday for new comic day. 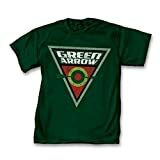 Sheldon enjoys wearing Flash and Green Lantern t-shirts (amongst others), along with other cool geek designed t-shirts so let’s have a look at some of Sheldon’s tees. Do You Love Sheldon's T-Shirts? No, I'm not a geek! Sheldon Cooper seems to love his Flash t-shirts as he has several different varieties of them. I must admit whenever I see a picture of Flash or a Flash costume I can’t help but think ‘zoom, zoom’ and if I’m with my hubby or daughter I’ll just say ‘zoom, zoom’ and they’ll be in stitches with me. I’m referring of course to the episode where Sheldon tries coffee and at the end he comes out in his Flash costume looking for more coffee. It was yet another hilarious episode like all of the other Big Bang Theory episodes, but now on to the t-shirts. In actual fact Sheldon has been seen sporting a Flash costume in several episodes to date and factor that in with the sheer number of different Flash t-shirts that he has worn I would surmise that his favourite superhero is probably Flash, although I don’t think he’s revealed his favourite superhero on the show yet. 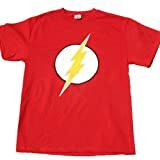 These Flash t-shirts opposite are all ones that Sheldon has worn on the Big Bang Theory although I know it’s not a complete selection as there are a couple that I haven’t been able to find for sale. 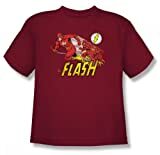 I’m sure that with the popularity of the series he’ll probably find yet more flash t-shirts to wear in the future, in fact I was amazed to find some available that I haven’t seen him in yet! As well as the classic red Flash symbol tee which is the first one pictured Sheldon has also worn one very similar to this with rings on the sleeves, the particular type of band/ring that Sheldon is seen wearing is different to the ones that I've been able to source which is why I have only included the 'classic' tee for you. If you wanted to dress up as Sheldon for a fancy dress event you could probably choose any superhero t-shirt and wear it over a long sleeved shirt with plaid pants and everyone would know who you were! Sheldon wears the red Flash tees with either a blue or green long sleeved shirt underneath. He has worn both a bright green and a darker almost muddy brown shirt underneath the red Flash tees. When he wears the grey Flash tee Sheldon usually wears a brown and yellow striped long sleeved top underneath, although in some scenes it does seem to have a maroon tinge to the brown. The black Flash t-shrit has been worn with just a green shirt I believe and the orange Flash shirt is usually accompanied by a blue long sleeved shirt. The Green Lantern is another super hero who’s t-shirts Sheldon seems to love to wear. Whether it’s the classic Green Lantern symbol or a more retro feel tee these are the Green Lantern t-shirts and various Lantern Corps tees that I’ve seen Sheldon wear on the series. 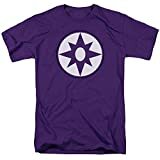 I must admit that I love the violet symbol, but only Sheldon would think of wearing a red shirt underneath a bright violet t-shirt. Amazingly enough it actually works on him! As well as the first Green Lantern emblem t-shirt shown below Sheldon also sports a green t-shirt with the same emblem in white. Exactly how does Sheldon Cooper like to wear his Green Lantern t-shirts? Well the classic Green Lantern emblem is usually donned over a brown and beige striped long sleeved shirt, the Green Lantern Bulls Eye t-shirt is also usually worn over stripes this time yellow and grey. The other green Green Lantern shirt that I've found out of all of Sheldon's shirts is generally worn over a red long sleeved shirt. He really does like the green and red combination doesn't he? 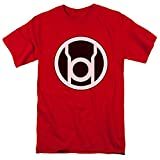 I can only recall Sheldon wearing the Red Lantern Corps shirt once and I had to google what the symbol was......I admit it I don't know all of my comic superheros. Sheldon wore this tee over a grey and black striped long sleeved shirt. Sheldon Cooper is so tall & thin that his friends have called him a large praying mantis! What this means is that he can carry off stripes really well and, as you can see, he often does. 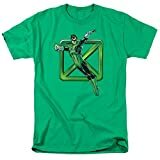 I have seen Sheldon don this Manbot t-shirt on several occasions and I actually had to ask my hubby if it was a comic book superhero that I didn’t know! As I've already said Sheldon wears his t-shirts over the top of long sleeved shirts and with his classic manbot t-shirt we have seen him wear it over a red shirt a few times. The manbot tee has also been worn over a grey and red striped shirt and a blue shirt. Sheldon has worn other superhero t-shirts besides Flash and the Green Lantern including Hawkman, Aquaman, Batman and Superman. Now Sheldon (as anyone who watches the Big Bang Theory would know) has some pretty strong views on things so it should come as no surprise that he has a favourite number – 73. He has even worn a t-shirt with 73 on it, but what is it about this number that is so special? According to Sheldon, “….73 is the 21st prime number and its mirror, 37, is the 12th prime number. And 12's mirror, 21, is the product of 7 and 3. It is also a palindromic binary number 1001001.” With that logic I’m sure these number 73 tees will be flying off the shelves! There are so many more Sheldon t-shirts that I haven’t been able to either source or fit onto one webpage! I especially liked the television color bars and the robot evolution t-shirts that he has worn, but I haven’t been able to source them in the right colors. Big Bang Theory is one of the funniest shows on the television at the moment so we should get to continue to see Sheldon and his friends (and even his acquaintance Howard!) for some time to come along with some more great t-shirts. 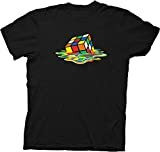 In Season 5 we see Sheldon wearing a new shirt - of a melting Rubiks cube and this really is my favorite Sheldon shirt so far. That's probably because I have a soft spot for Rubiks cube, but it's a pretty cool design. Have a look opposite and see if you don't believe me, it's not only a shirt for TBBT fans, but also for children of the eighties! The Big Bang Theory is one of the funniest shows that is playing on our television right down. It's basically like a Beauty and the Geeks meets comedy hour and it's hilarious. I find the Big Bang Theory to be incredibly funny and the star of the show (in my opinion) has to be Sheldon Cooper. Join me in reliving some of Sheldon's awesome quotes. If you love Sheldon's t-shirts then what about looking at Howard's belt buckles? These belt buckles are fun to wear and also make a great gift idea for any Big Bang fan. Which is Your Favorite Sheldon T-Shirt? Sheldon is hilarious but I also like Leonard. Very funny show. I don't know how I have missed both Sheldon and the Big Bang Theory. Sheldon definitely makes the show a big bang on popularity. The rest of the nerds are cute...but Sheldon is the glue. Thanks for explaining the 73. I've been living in a paper bag. If you're looking for some great Big Bang Theory shirts to buy then you're in the right place! I've compiled some of the best Big Bang Theory t-shirts available online for you.